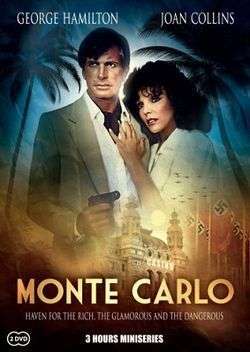 Monte Carlo is a 1986 CBS television miniseries starring Joan Collins. An adaptation of the 1983 novel of the same name by Stephen Sheppard, it is a spy thriller set in Monaco during World War II. The miniseries was produced by Gerald W. Abrams, Collins and her then-husband Peter Holm. Adapted from the 1983 novel Monte Carlo by Stephen Sheppard (Summit Books, ISBN 0-671-44789-0), the teleplay was written by Peter Lefcourt. The miniseries was produced by Gerald W. Abrams, Collins and her then-husband Peter Holm. Directed by Anthony Page, it was reported to have cost $9 million. The four-hour miniseries was broadcast in two parts on CBS starting on November 9, 1986. John J. O'Connor of The New York Times wrote that "Monte Carlo gives us the beginnings of World War II as they might have been conceived and executed by a couturier." He noted that Collins has "more than three dozen costume changes", and that she "is convinced that her fans want only romantic adventures and beautiful people in gorgeous clothes". Collins also produced and starred in the CBS miniseries Sins earlier the same year. 1 2 O'Connor, John J. (November 7, 1986). "CBS Offers Monte Carlo, Starring Joan Collins". The New York Times. Retrieved March 7, 2015. This article is issued from Wikipedia - version of the 1/30/2016. The text is available under the Creative Commons Attribution/Share Alike but additional terms may apply for the media files.